Purdue University Krannert School of Management was founded in 1962 through the vision and monetary gifts of Herman C. Krannert and Ellnora Decker Krannert. Herman C. Krannert became an entrepreneur at an early age after a Chicago streetcar accident took his father’s life. He accepted ever-increasing levels of entrepreneurial challenge until his death in 1972. 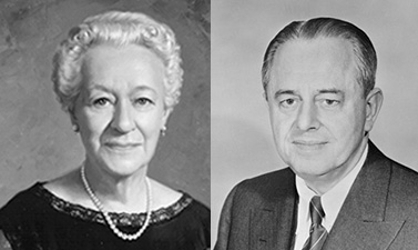 Herman and Ellnora Krannert devoted much of their time to philanthropic projects and educational programs for the establishment of “centers of excellence.” Purdue’s Krannert School of Management is one such center. Krannert founded Inland Container Corporation in 1925. Under his 47 years of leadership, Inland Container became the world’s fourth-largest shipper of corrugated fiber products. The Krannerts established a generous endowment for managerial studies at Purdue. For eight years, Herman C. Krannert was a visiting professor delivering noteworthy lectures to students and faculty on the Purdue University campus. The Krannerts’ foresight and generosity set the foundation for the Krannert School of Management to become a nationally recognized, elite educational institution. We ask for your vital financial support to continue the legacy of Herman and Ellnora Krannert.